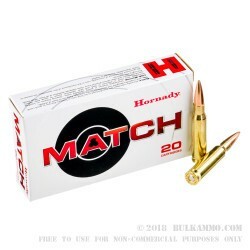 Hornady Match grade .308 ammunition is designed for maximum accuracy. 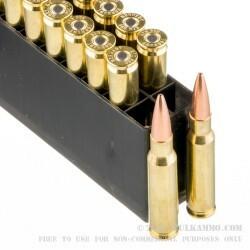 Whether up close or at range, you can be sure these cartridges will put munitions right on target. Their Hollow Point Boat Tail design is tailored to promote accuracy, with a seamless jacket that runs all the way around the bullet. If accuracy is your goal, Hornady Match will deliver. At 500 yards, the bullets bleed 30% of their speed and 50% of their energy, with a trajectory drop of 51 inches. These 178 grain Hornady Match HPBT cartridges produce x foot pounds of muzzle energy and travel downrange at x feet per second. 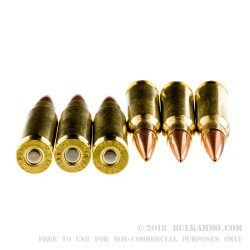 Their casings are boxer primed brass which can be reused. The cartridges come packaged in a nose down plastic stand-off, which is boxed in Hornady Match branded card-stock.